Hi Elaine – I’ve been doing some thinking since the baby massage yesterday. I loved the class and so did Freya she slept all day yesterday! But what I came away with after seeing all the other mammas breastfeeding was feeling a bit guilty that it didn’t work out for me. 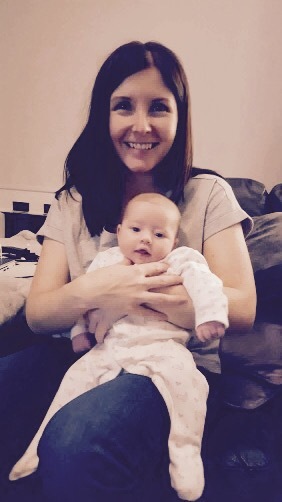 I was so determined to breastfeed I really was – I thought it’s the most natural thing in the world, how hard can it be?! Funny enough it is really hard – especially after a section! So I was thinking about the question you had up on your Yoga Mammas fb page about what advice would you give to someone who’s had a section. I know I said take all the painkillers and let people help but after some thought I think my advice also be this… apparently when you have a section it’s takes longer for your milk to come in – it did in my case anyway. Mine didn’t come in until day 6 which meant I had a very hungry baby on my hands and I couldn’t feed her. I did manage, with the help of the midwives to hand express the colostrum to give her but ended up having to give her formula as I just had no milk to give her. After finally meeting the hospital lactation consultant on the day I was leaving she said to use the hospital grade breast pump to help get the milk to come in. No why they didn’t just tell me this on day one I don’t know. Anyway that’s my advice for anyone who’s had a section and their milk hasn’t come in yet – get going on the hospital breast pump! I pumped for 4 weeks so Freya got some breast milk. The main thing I keep telling myself now is she’s happy, healthy and thriving and that’s the main thing! Hope I don’t sound like I’m having a pity party! !